Hi everyone! Madison here! Cécile volunteered to pose for the ending results of the Party Hat today. Yup, that’s what we’re making today at Creative Craft Corner – a party hat! This craft is just a bit more difficult than some of my other ones, so adult there to help you would be great. •Tinsel or multi-colored yarn, braiding corn, string, or anything like that. •Crayons, markers, paints, stickers, anything to decorate with! Now, decorate the outside of your paper plate! I like this bubbly design. Now take the two edges of the paper plate and pull them together. It will form a point at the top of the party hat. 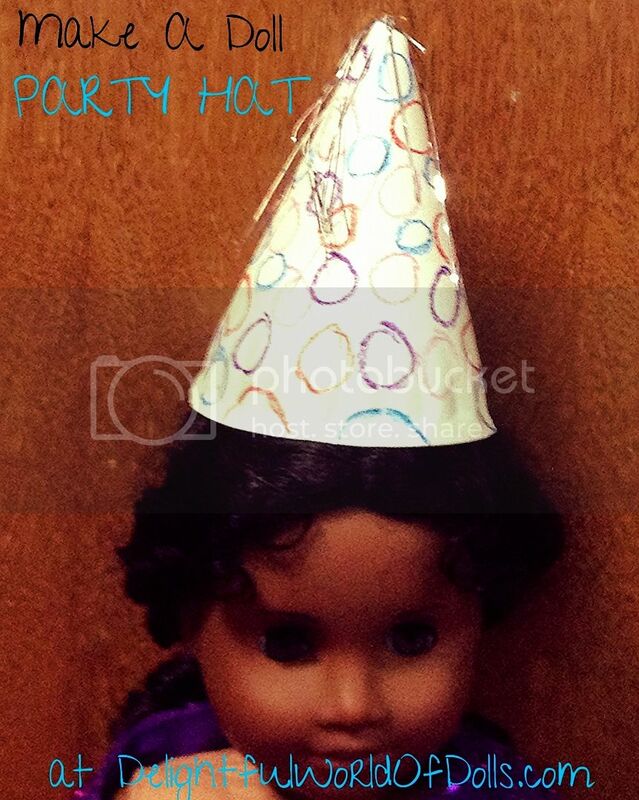 Overlap the edges some if the party hat seems to big to fit nicely on your doll’s head. Our party hat is almost done! (oops,I realized the hole at the top of mine was too big when the hot glue had already cooled and dried. Make sure yours is just a little bit smaller. Now take a section of your tinsel or colored string or yarn or whatnot and tape the ends altogether. Please tell you me taped it, because it will be SO much easier this way! Unfortunately, I had to tie mine together with another piece of tinsel. See how messy it is at the bottom? It’s going to be hard to get it in the that this way. Now stick the end of your tinsel/string/yarn or whatnot into the hole in the top of the hat. If you used tape to bind the ends together, this should not be hard. Yay! Your party hat is complete. Make as many as you want so all of your dolls can have a party. P.S. If you made this craft, tell me! I would love to know. So cute, I am going to try that for Kits birthday coming up in May! I nominated you for the MagNeoBio award. Awesome!! I’m gonna make those for Isabelle’s birthday! Madison I don’t have a blog yet but what are you using for your blog? I use WordPress for my blog. It costs ten dollars a year (for me, it might be different for you), but it is worth it. But at first I started out using Blogger, which was free. Really? I don’t have to pay for mine. Well what do you recomend getting first?